A Berkshire-based fancy-dress retailer is being made to surrender the starwars.co.uk web address after feeling the force of Disney's wrath. 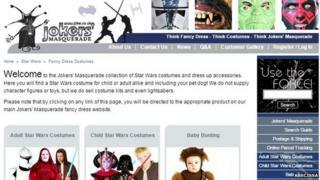 The British company uses the address as a way to direct shoppers to a section of its Jokers' Masquerade store dedicated to Star Wars-themed costumes. It has owned the domain name for more than a decade, and was asked to surrender it last year but refused. Now, Nominet - which oversees .uk domains - has ruled it must do so. The company has until 21 July to decide whether to appeal. "If the new Star Wars films by Disney were not being released, we wouldn't be having this discussion," Mark Lewis, Abscissa's chief executive, told the BBC. "They wanted the starwars.uk domain, they haven't [got it], and in essence they've thrown their teddies out of the pram. "That's how we feel. Are we disappointed? Yes. Are we surprised? Not necessarily." Walt Disney Company bought Lucasfilm - the production company behind Star Wars - in 2012 for $4.1bn (£2.6bn). A spokesman said that had it acquired all the intellectual property surrounding the Star Wars franchise as part of the deal. Abscissa had attempted to defend its ownership of the domains by highlighting that it had used the starwars.co.uk and star-wars.co.uk addresses since 2003 without being challenged. It suggested that it was only because Nominet had introduced shorter "name.uk" domains in 2014 that Disney had acted. Last year, Nominet gave owners of .co.uk addresses a "first dibs" right-of-refusal to purchase related shorter domains - something Abscissa took advantage of. After being contacted by Disney's lawyers, the retailer offered to transfer the starwars.uk domain to the US media giant if it could continue using starwars.co.uk and star-wars.co.uk to sell "legitimate Star Wars-branded merchandise". The current registration is judged to be "abusive"
Following a three-month process, it ruled in Disney's favour. "Star Wars cannot sensibly refer to anyone else other than the complainant," wrote Nominet's expert Steve Ormand. "It is highly likely in my view that any user searching for Star Wars and arriving at the respondent's website will have suffered initial interest, confusion and falsely inferred a commercial connection with the complainant. "I am also satisfied that the respondent has taken advantage of the 'pulling power' of the name Star Wars to attract users to its website." Mr Ormand added that the fact Abscissa had used two of the domains for 10 years had no bearing on the case. This is far from the first case Nominet has had to resolve in this manner. In 2014 alone, it ruled on 98 disputes, and none of these rulings led to an appeal. They included forcing an official-looking website using the dvla-driving-licence.co.uk address to be transferred to the government, and ilovealdi.co.uk to be handed over to the supermarket chain. Disney has previously used the service to seize waltdisney.co.uk and disneycruises.co.uk from other parties. Abscissa itself has also benefited from the dispute-resolution process, by wresting control of jokers.co.uk from a fancy-dress rival in 2007.